The rustic cottage is located on a quiet dead end road and is extremely homey. This waterfront cottage has 1 double bed in the living room quarters as well as a pull out sofa bed and wood stove.Very comfortable with 2 window air conditioners. The screened in porch has a loveseat and twin bed, overlooking the lake.The kitchen is fully equipped. The deck off the kitchen overlooks the lake and is a relaxing place for a meal. The cottage has a private dock that you are welcome to swim, fish off or dock your boat, as the boat launch is a half mile away. There are swim floats, life jackets, a small kayak, row boat, canoe and paddle boat. Take advantage of the beautiful outdoor stone fireplace, the wood is also included. We also have a sister cottage 3 cottages away, that also sleeps 5. If you get a chance, this is the place to stay! Quiet, relaxing, fully stocked! Love this adorable lake front cottage!! The cottage was perfect! Small but just enough room, breezy, fully stocked. The kids enjoyed the lake front, fishing, canoeing, paddle-boating...Perfect weekend escape. Would love to come back! Thank you so much!! We enjoyed being on the lake and the kids loved fishing from the dock. Everything we wanted to go and see was just minutes from where we stayed yet we were away from all the noise. We enjoyed lounging out by the fire, sipping our morning coffee on the dock and so much more. This cottage was packed with just about everything we needed to enjoy our stay and we look forward to returning again in the future. This is a great little getaway spot and the owners made it very easy. Everything is ready to go so you just have to bring the basics and most everything else is covered. The lake water was clear and calm and we lucked out with some perfect weather. It was a perfect weekend retreat. Highly recommend. Bit of a stretch to call this cabin suitable for 5 people, especially at the price of $250 per night - we had to spread out our own foam mattress on the kitchen floor for number 5 - luckily we all get along! The internet wasn't working when we arrived, but the hostess was very responsive and after a couple of hours and two conference calls with comcast we got it up and running. 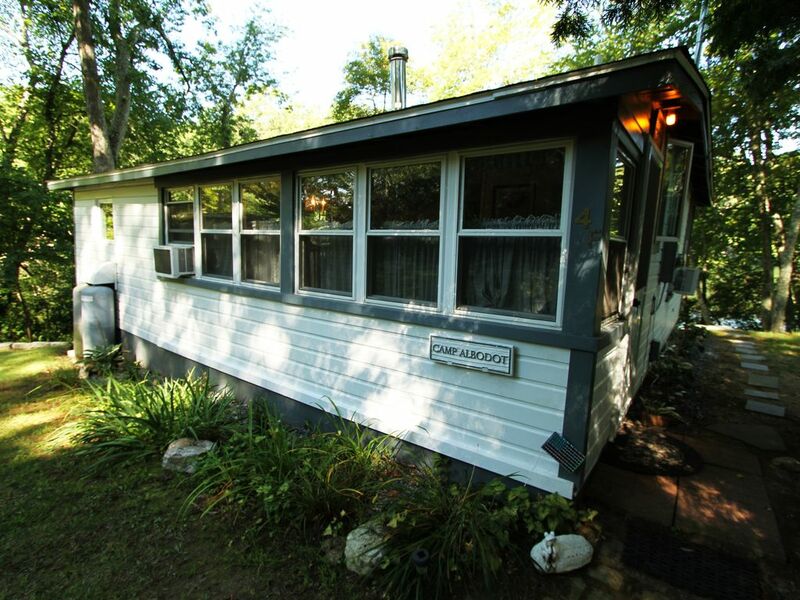 Super cute & clean cottage, close to CT fun spots! The cottage was super clean, well stocked and decorated really cute. Beds were comfy, linens smelled fresh and loved the screened in front porch. It was very close to the casinos, Mystic and other fun spots in CT. The only down side was the swimming area has lots of underwater plants and for me that was a deal breaker for swimming however, if you are looking for a quite getaway spot that is super clean, this is your place. Thank you Sue for a great week!